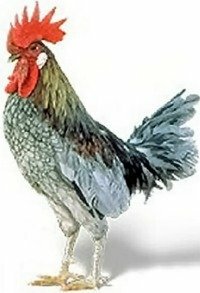 The Blue Hen of Delaware is a chicken breed that is not only the state bird of Delaware, but also has a storied past that dates back to the Revolutionary War. Size: Male: 5 Ibs. Female: 4 Ibs. Comb, Wattles & Earlobes: They have a small single comb that has five points that stand upright. They have small, thin, smooth wattles and earlobes. All of these are bright red. The Combs, earlobes, and wattles are dubbed (cut off) in roosters for show. Color: They have a yellow beak, reddish bay eyes, and willow shanks and toes. The head, hackle, cape, and saddle can be in shades of yellow and orange. The front neck, lower body, and tail are steely blue. Special Qualities: They are the state bird of Delaware. This bird is not only the state bird of Delaware and the mascot of the University of Delaware, but has an interesting story to go along with it. Cockfighting was a regular pastime in Colonial America. It is even said that Washington and Jefferson kept fighting birds. Captain John Caldwell of the Kent company, which was part of the Delaware regiment, was a devoted gamecock owner. His troops fought throughout the entire war and gained a reputation for their bravery and fighting abilities in battles with the British in Trenton, Princeton, White Plains, and Long Island. During down time the troops entertained themselves by staging cockfights with a blue feathered breed dubbed the Kent County Blue Hen. Word quickly spread that these "blue hens" were the birds to beat. In time, the regiment came to be known by the nickname "Blue Hens' Chickens" in respect for the fighting abilities of both the fighting regiment and their birds. The Blue Hen of Delaware we know today is a unique strain that was developed from Old English Games. Over the years individuals continued to keep these birds, including Hallock DuPont, who donated six pairs of these birds to the University of Delaware in the 1960's because the bird was their mascot. A poultry professor at the University decided to cut down on the gold that these birds had on their hackles and cross bred the flock with Blue Andalusians. Today the University had the largest known existing flock of Blue Hens, although the flock now carries some Andalusian characteristics such as bigger wattles and even some white in the earlobes. There are still some Delaware natives that continue to keep the traditional bloodlines of the Blue Hen. The breed is not recognized by the APA.